Today as part of the Intel Insider program, a social media brand ambassador program, I am visiting Intel's Portland, Oregon microchip manufacturing facilities. I am excited to be in Portland for the first time and look forward to learning how they make chips. I will most likely be streaming some videos today and tomorrow via Qik and UStream.TV on my iPhone so be sure to check back (videos streams shown below). I will be using Brightkite, Flickr, Tumblr, Facebook and Twitter to keep you updated on how things are going. Hopefully my iPhone will have enough juice to keep the content flowing all day long. Our day concludes at the Social Media Club Portland Tweetup event tonight with the rest of my Intel Insider pals, so if you are in the area come by and say hello!!! CES 2009 Here I Am! I packed my bag last night and took the first flight possible this morning to Las Vegas to attend the Consumer Electronic Show. While packing last night, I felt very much like aschek on Twitter (left) as I packed a lot more technology gadgets than the normal traveler. I packed my work Blackberry, Nokia N95 to stream videos updates live via Flixwagon, my Canon Powershot SD850 to capture snag shots and the occasional video, my Canon VIXIA HF100 HD camcorder to record SOMEWHAT FRANK video episodes and my iPhone which can take and edit photos with a number of Apps including (PanoLab, CameraBag and PhotoGenie, among others) and stream live video to the Web via Qik (thank you Qik). That is a lot of equipment and I have only covered my phone/cameras. Aside from that I have my laptop and a number of other gadgets. For the 20 percent of clothing, I threw in a couple fine Taylorbyrd button down shirts to choose from. This is my first time attending CES and I want to thank Intel and the Intel Insider program for making it possible. So what do I have on tap? 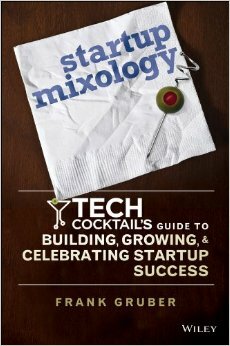 Tonight (Thursday), I am co-hosting the Intel CES09 Kickoff hosted by @briansolis @sarahcuda @zappos @somewhatfrank and @intelinsiders at the The Sportsbook Bar & Grill in the Palazzo. In case you are not familiar with the venue, it was formerly the 40/40 Club, which was owned by hip hop star Jay Z, so it is sure to offer plush furnishings, lots of technology and bling. I hope to see you there as it should be a great event. Intel will show off some of the latest Netbooks which sport the new Intel Atom processor (a very tiny but powerful processor) and if you visit the Intel booth on Friday at CES you might even be able to win one. Also be sure to tag your Twitter tweets, Flickr photos and YouTube videos CES09 so they get added to the ultimate destination for tracking all the CES social media action at ConsumerElectronicsInsider.com. Having a pet can be a lot of responsibility and time. For jettsetters like myself I have had to go the low maintenance route the last few years as I had a pet fish. Unfortunately, my pet fish just passed away yesterday after 3 years - R.I.P. Art the Beta Fish. :( So I may be in the market for a new pet and I have been looking for other alternatives to having a pet which have included pet rocks, chia pets and other options. I recently visited the office my friend Micah Baldwin at Lijit and met his office pet, Kyle, a lovable green PLEO robotic pet dinosaur by UGOBE. Check out my visit with Kyle the PLEO dinosaur in episode 48 on SOMEWHAT FRANK - adventures into a personal technology lifestyle, in the video below. 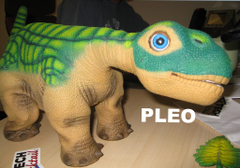 PLEO: A Low Maintenance Robotic Pet Dinosaur from Frank Gruber on Vimeo.